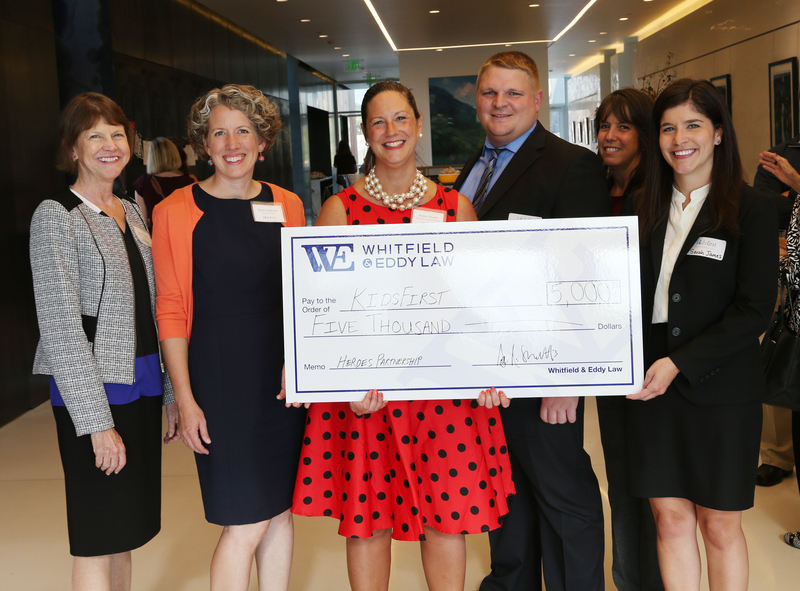 Whitfield & Eddy Law attorneys donated $5,000 to Kids First Iowa at their Des Moines Kick Off on Thursday, September 15, 2016. Kids First Law Center gives children a voice in divorce and custody conflicts by providing legal representation and services for kids. Kids First is a mission-driven organization that seeks to mitigate the negative effects of divorce on children. The firm's charitable donation was the lead gift for the fund drive to establish a Des Moines, Iowa office. From left, District Court Judge Eliza Ovrom, Kids First Law Center Executive Director and Founder Jenny Schulz, Whitfield & Eddy Law attorneys Anjela A. Shutts, Van T. Everett, and Kimberly S. Bartosh. Learn more about Kids First Iowa at their website.